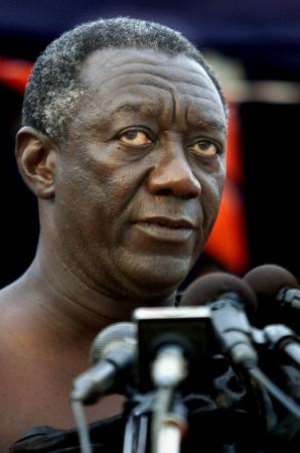 Mr Kufuor has helped make Ghana an unusually well-run country There's always a danger, when interviewing Ghana's President John Kufuor, that he will launch into an analysis of what is popularly known in Ghana as "Hipic". This is not, as you may suspect, a nasal ailment related to the sneeze or the hiccough, but the Ghanaian rendition of the acronym HIPC. This is a worthy international scheme for rewarding well-administered "highly indebted" countries with cheap loans to provide decent social services for their people. The problem with "Hipic", worthy though it may be, is that it is rather complicated and boring; it does not make exciting journalistic copy. One of Mr Kufuor's other favourite topics is value added tax, or VAT. Ghana is one of the few countries in Africa where, if you visit a standard hotel or restaurant, you get a bill with a proper VAT receipt. The receipt is numbered and bears a difficult-to-copy logo, or hologram. The idea is that the hologram is impossible to counterfeit, and so the intended tax revenue actually goes to the government. Again, rather boring but undoubtedly important. A friend tells a story of how, twice this month, he was caught speeding in his car by the Ghanaian police. On both occasions he was politely and promptly told of his infringement and fined the requisite amount - the same amount, both times. This may sound banal, but the truth is that in the west African context it is little short of revolutionary. It is almost inconceivable that you could be stopped for speeding in, say, Ivory Coast or Nigeria, and not be subjected to a lengthy palaver that is in reality a demand for a bribe to get off the hook. So Ghana is a rather special, and unusually well-administered country by any standards, and particularly by the standards of west Africa. Even if it, and maybe even its president, are sometimes accused of being a little boring. When I got the chance to interview Mr Kufuor in London this week, I decided to take this bull by the horns and ask him the rather cheeky question: Was he boring? African readers of this, especially, may find this unforgivably disrespectful. Elders in Africa are supposed to be shown respect, not asked impudent questions. But I still think it is a legitimate question, and my defence is this. Think of the world leaders who make headlines: Gaddafi, Bush, Sharon, Mugabe, Taylor. They all do newsworthy things and provide excellent stories for us journalists. But when was the last time you heard of an international incident, war or scandal involving Mr Kufuor? If you search carefully you will find that Mr Kufuor's government is embroiled in political controversies at home that are very important in the local Ghanaian context. Privatising the management of water provision is controversial among Ghanaian voters, for example, as is the cutting of government subsidies on gasoline. And the government's treatment of an ethnic dispute in the north of Ghana has been questioned. But these Ghanaian disputes rarely degenerate into political mud-slinging and still less, as in much of the world, into war. It is all a bit boring, really, for us journalists. And so, after a run through the usual journalistic questions - how is Kufuor dealing with Ivory Coast conflict, the privatisation issue, whether Ghana is under the thumb of the IMF - I braced myself to ask the question. I put it to Mr Kufuor that while some African leaders were hotheads and demagogues, no-one could accuse him of being that. But would it be fair, I asked tentatively, as some people suggest, to say he is a bit boring? The president of Ghana quietly but firmly put me in my place. "If boredom gives us peace and stability for people to go about their normal businesses and live in dignity," he said, "then I would say let's have more boredom."